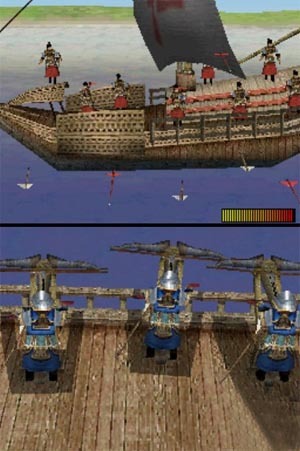 February 14, 2006 - Real Time Conflict: Shogun Empires is a long-awaited title simply because it's one of the first real-time strategy games for the DS. The unfortunate part is that this game is so basic that it can only serve to entertain newbies. It's got less depth than the average tutorial. 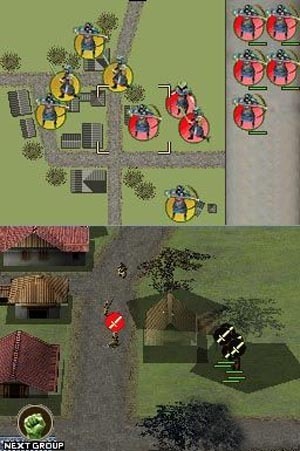 Events take place in Feudal Japan when the country begins losing its honor and influence to several hostile factions that threaten to tear it apart. As fate would have it, two brothers are poised to take back the country and earn the title of Shogun. Each brother employs different tactics. Takeshi is the diplomat and tries to resolve situations through non-violent means. Kenshin is the warrior who will defend his territory and attack other territories with his army. Real Time Conflict: Shogun Empires plays more like a board game than a videogame. It contains elements of Risk and Diplomacy. Unlike Diplomacy there is some chance involved and unlike Risk, it's just not a very fun game due to limited depth. There is virtually nothing in this game that couldn't be included on a cell phone. The story and the set-up show promise but it quickly settles into a predictable pattern. It's like boarding a plane only to find later that it's a bus and you're going to travel the country through backroads on a milk run. The gameplay is that ponderous. The object of the game is to acquire as many provinces as possible. Each province you control will add to your arsenal, resources and finances. You can enter unoccupied neighboring territories without a problem but other provinces will put up a fight which can cause you to go to war. 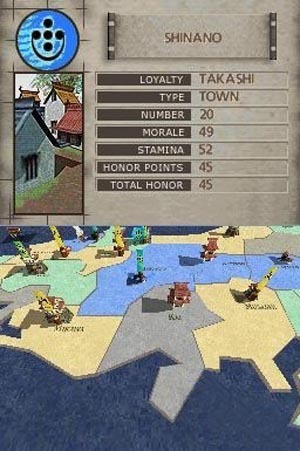 If you decide to use diplomacy by employing brother Takeshi, all you will have is two options and the province can either accept or reject them. There is no negotiation, no mini-game, no stats or points to augment your influence. It's just like a random roll of the dice and there's diddly that you can do about it. If you're playing the game anyway, it's worth a shot to acquire a territory without a costly war, but eventually you're going to want some action. That's where Kenshin comes in - and out. Combat is slow and the AI doesn't do much except offer themselves as target practice. 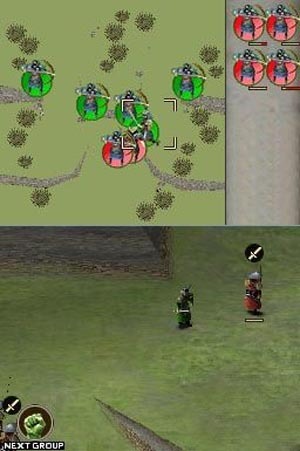 You command units that include archers, swordsmen, spearmen and horsemen. Using the stylus you put them into position and issue orders from the bottom of the screen. There are two maps, the main one and the small one. You can change their position to whichever screen you prefer. I really like this control system. It's convenient and flexible. It's the closest thing to a PC style and is perfect for this genre. It's just too bad that this isn't a good representation of the genre but it will pave the way for better RTS games. Commands that are issued in real time is like screaming in a vacuum. There is nothing to indicate that your orders have been accepted and it may cause you to re-press the button many, many, many, many times. Or maybe that's just my neurosis that causes me to do things like that. In any case it only seems to accept the one input, but you have to wait until the other orders are carried out before it takes effect. Before each turn you can consult with advisors that will list your stats for you which include resources, finances, diplomatic developments, unit production and updates on your spies. The various territories also have stats such as morale, stamina, loyalty and total honor which you can use to plan your attacks. This information gives you an overall indication of a territory's strength or weakness but little more than that. It appears more complex than it really is. The more hits that a territory receives the weaker it becomes and all of the stats will show a decline in each category. This is really an ugly looking game. The battlefield in particular looks like a videogame wasteland. Even Space Invaders wouldn't want to lay claim to these environments. Some of the buildings look good with period-specific architecture but the battlefield is so plain that it looks like a golf course of flat green plains. The sprites are small and look like newly hatched Sea Monkeys. They don't animate well and they follow the simplest and most direct path - like fire ants. The music is good but the death knells from the battlefield not only overshadow the soundtrack, they foreshadow the entire state of the game. All over the world gamers are screaming that they wasted their money on this game. The buildings don't look bad but the environments are barren and sterile. The sprites are ugly and move like ants. Just about everything is limited here. Most of the game is on automatic pilot. The music isn't bad but that screaming from the battlefield sounds like a nail on a blackboard. There's not much here to replay since there really wasn't much to play in the first place.